Caremark (Sutton) was officially launched at the S CILL Centre in Robin Hood Lane by the Mayor, Cllr. Sean Brennan, OBE. (last Friday May 9th). The home-care company has implemented a special phone 'app' to ensure its services are the most efficient and effective available. The care workers use mobile technology to avoid having to use their customers' landline telephones. 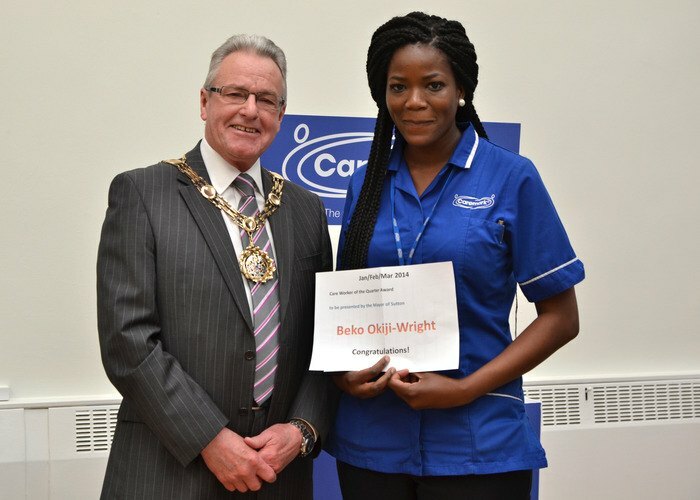 One of Caremark's award-winning carers, Beko Okiji-Wright (pictured), was on hand at the opening event to demonstrate how the special software on her mobile phone means she can travel from one customer to the next without having to call in at the office to get the vital paperwork or the latest care update. Everything is downloaded securely to the phone. The system also monitors the time spent with each of Caremark's customers and has an in-built alert mechanism that escalates the priority of a particular customer if urgent attention becomes necessary. "If we have all the information we need to look after our customers at our fingertips, we have more time to spend caring for them," says Beko. Cllr Brennan told the ceremony how the need for care when we are unable to care for ourselves is something we should all plan for. Sutton has a population of two hundred thousand people. Two in ten of those will need care at some time in the next decade. "I am so proud of how the people of Sutton and the organisations they represent are so comfortable and competent at collaborating. The excellent service offered by Caremark (Sutton) is a perfect example of how that collaboration comes together for the common good," he said. Sutton's Caremark franchise is run by Debbie and Simon Binner and a team of dedicated care workers. One reason the organisation was launched in Sutton was as a tribute to their daughter, Chloe, who passed away after a long illness in February last year. Chloe would have been 19 this year and attended St Philomena's School. "The number of people who need care is growing in Sutton - this is at a rate a little higher than across the country as a whole. Many people want to stay in their home to be looked after for as along as possible. We offer people that opportunity." says Simon. For more photographs from the day, please visit the Caremark Facebook page.